The appointment of Yang Jiechi as China's new foreign minister comes as no surprise to the people who have worked with or known him for years. A career diplomat with three overseas postings to his name - all in the United States, starting as second secretary to the Chinese ambassador - 57-year-old Yang has impressed many with his broad knowledge, mastery of the English language and persuasiveness. Jeff Bader, director of the John L Thornton China Center and a senior fellow of foreign policy studies at the Brookings Institution in Washington DC , first got to know Yang in the 1980s, when Yang worked in the US capital as second secretary, first secretary and then counselor at the Chinese Embassy. "I recall him at the time as a highly skilled, knowledgeable and professional diplomat who was an especially eloquent and persuasive spokesman and representative for his government," Bader told China Daily. "His extraordinary ability in the English language also made him a standout among foreign diplomats in Washington," Bader said. David Shambaugh, a professor of political science and international affairs and director of the China Policy Program at the George Washington University, told China Daily: "He is personally very suave, articulate and persuasive. "His knowledge of our country is deep and sophisticated, and he has an extraordinary range of contacts throughout American society." John Hamre, president and CEO of the Center for Strategic and International Studies, recalled inviting Yang to speak to his board of trustees. "He knew virtually all of my board members personally from extensive prior experiences - Henry Kissinger, Zbig Brzezinski, Jim Schlesinger, Carla Hills," Hamre said. "They had all worked with him for years." Yang's third tenure in Washington DC began in January 2001, as the youngest Chinese ambassador to the US since the two countries normalized diplomatic relations. Before he was well settled, a US Navy spy plane collided with a Chinese jet fighter, killing the Chinese pilot and having to make a forced landing in China's island province of Hainan. Soon after, the Bush administration announced its missile defense project and its plan to sell arms to Taiwan. It also raised the issue of China's record on human rights at the annual session of the UN Commission on Human Rights in Geneva. "But if anyone is well placed to handle the tough relationship, Yang is," the US National Public Radio said in a broadcast in July of the same year. "Yang Jiechi understood that his job had two objectives: to faithfully represent his government's position, and at the same time to be a good listener and to make friends for China by showing understanding of what others had to say about its policies," Bader, who was then assistant US trade representative handling negotiations on China's accession to the World Trade Organization, recalled. "He quickly persuaded the Americans he dealt with that he was superb at both requirements of his job," he said. Shirley Young, a former president of Committee of 100, said in a telephone interview with China Daily: "He knows how to humanize the relationship, which is important in communication and dealing with difficulties. "He is open-minded and willing to look from the other person's side as well," she said. Bader said: "Along with Ambassador Robert Zoellick, we worked with Ambassador Yang to clear away obstacles to US endorsement of China's accession (to WTO in 2001) and the US granting permanent normal trade relations to China." 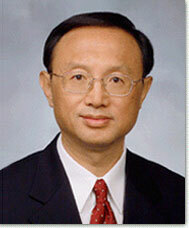 In 2004, the Los Angeles World Affairs Council presented Yang with the Diplomat of the Year Award, in recognition of "the outstanding record of Yang Jiechi in his various assignments during his time in the (Chinese) Foreign Ministry, and his efforts in Washington to broaden and strengthen Sino-US relations," J Curtis Mack, II, president of Los Angeles World Affairs Council, told China Daily. He said the committee unanimously voted to recognize Ambassador Yang with the award and also to mark China "as a very important player and partner on the world stage". Apart from his skilful handling of political as well as economic and business affairs, Yang displayed his familiarity with art and culture. He is also known as an accomplished calligrapher, Shambaugh said. Shambaugh especially remembers the classical music concerts Yang hosted in his residence, which is "not only unprecedented among Chinese ambassadors, but very unusual in the diplomat corps," he said. Coming from a diplomatic family herself, Young especially took heart that the former Chinese ambassador knows how important culture is in achieving cross-cultural understanding. Yang helped initiated the Festival of China at the Kennedy Center for Performing Arts in Washington DC in 2005, which was a major cultural event in helping Americans learn more about China through a series of cultural performances and exhibitions. "He is able to go beyond politics to seek cultural and people-to-people communications," she said. "So he is easy to relate to and people easily find his explanations (about China's standpoint) more acceptable." Yang was being groomed for a career as a diplomat when he was chosen to join the first class of Shanghai Foreign Language School (SFLS) in 1963, after standing out from his fellow primary school graduates. The school was founded under the tutelage of late Chinese Premier Zhou Enlai, as "a cradle for New China's talents in diplomacy and foreign languages", as SFLS proudly announced on its website. However, the road ahead was bumpy. When the "cultural revolution" (1966-76) broke out, Yang and his classmates suddenly discovered they were no different from their peers in other regular middle schools. In 1968, he was assigned to work in the Shanghai Pujiang Electric Meter Factory as an apprentice. But his teachers did not forget him. With Henry Kissinger's secret mission to China and China's resumption of its lawful seat at the United Nations in 1971, the country was about to engage in a new wave of diplomacy with the outside world. The foreign ministry screened graduates from the leading language schools in the country and recruited a batch of young people with impressive academic achievements. Yang was again chosen. In 1973, he was sent to further his study in English and world affairs at the London School of Economics in Britain, where he studied for two years. On his return, Yang worked in the department of translation and interpretation, where the best young language graduates usually gathered to start their ascent of the diplomatic career ladder. "Yang brings special knowledge of China's relationship with the US in all its dimensions, including with the business sector and Congress, so American policymakers would be comfortable that he would understand how to keep the US-China relationship on an even keel," Bader said.